The transfer window is always a volatile and exciting time for clubs, players, agents and fans alike. Although everyone likes to track the wheeling and dealing, the reality is that much of the process is shrouded in confusion. 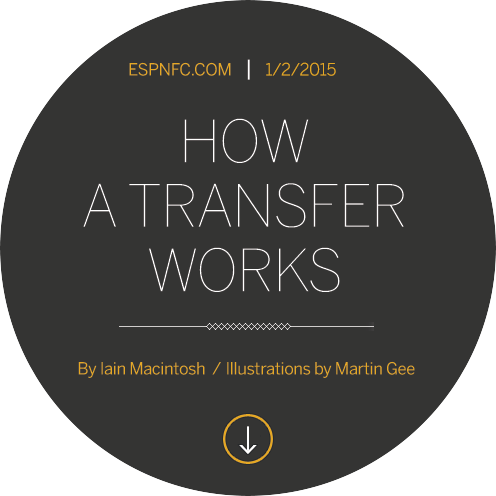 With help from former Tottenham and Liverpool director of football, Damien Comolli, and ESPN FC's own Gabriele Marcotti, we show you how a transfer works. To further bring the topic to life, you can also follow Iain Macintosh's tale of fictional rising star Dave Thumper. No club wants to lose its best players in January without time to replace them, so you often pay a premium. But if you're clever, opportunities may present themselves. Leagues that run through their season within the calendar year might have players available for a move: Clint Dempsey swapped Major League Soccer for Fulham in 2007 while Nemanja Vidic left Russia (a March-November season at the time) to join Manchester United in 2006. You can also find under-appreciated talent as clubs try to shed wages or players who aren't getting on the pitch: witness Daniel Sturridge's move from Chelsea to Liverpool in 2013. The biggest January transfer was Fernando Torres (Liverpool to Chelsea, 50 million pounds) but the biggest ever happened during the 2013 summer window, when Real Madrid paid 85.3 million pounds for Gareth Bale and eclipsed the previous record, also set by Real Madrid, of 80 million pounds for Cristiano Ronaldo. In fact, Real Madrid has set the record five times when you throw in Kaka in 2009, Zinedine Zidane in 2001 and Luis Figo in 2000. Dave Thumper wheeled away from goal and ran to the travelling supporters, kissing the badge and celebrating wildly in the corner of the stadium, tightly wrapped up against the freezing night air. "Yes, Thumper! YEEEEEES!" roared supporter Kevin, as he leapt in the air. "What a hit!" "Aye, enjoy it while it lasts, young man," said Derek. "He's not long for us." "Not this again, dad!" laughed Kevin. "Dave Thumper is Crumpleton through and through. He'll never leave!" Derek smiled ruefully. "Aye, they always say that. They say it right before they sign for someone else." "Not Thumper," grinned Kevin. "Besides, who's going to take a chance on a second flight English striker? He'll be here for years yet." By the time you read a player is linked with your team, the truth is they have likely been tracking them for months, if not years. (Tottenham spent a full season of weekly viewing before approaching Dimitar Berbatov.) For most of the bigger clubs, monitoring player progress is a continuous process and they'll keep an up-to-date database. They'll have a list of targets, usually by position, and will move quickly when someone becomes available (like Alexis Sanchez in 2014) or when they lose one of their regular starters. To do this well, teams must have done their homework. Did you know? In 2014, the most spending by any league was the Premier League (858 million pounds, net spend -387 million) followed by La Liga (425 million pounds, net 27 million), Serie A (260 million pounds, net -32 million), the Bundesliga (250 million pounds, net -85 million) and Ligue 1 (100 million pounds, net -78.3 million). The club that splashed the most cash? Manchester United spent 193.6 million pounds on players in their rebuilding project under Louis van Gaal. "Now, what about Dave Thumper?" said Charles Armitage. He'd been CEO at Millingford City for two seasons and had spent much of it trawling Europe for the next big thing. Who would have guessed that it might be in Crumpleton all along? "He's the real deal," said scout Graham Sheepshanks. "He's got quick feet, but he's got a quick brain too. Noticed it the first time I saw him. We could have got him for a lot less back then too." "The numbers add up," said Nigel Parker, head of Data Analysis. Graham grunted dismissively, but Nigel chose to ignore him. "His shots on target ratio is off the chart and he works hard too; he leads the Championship in chances created and he's never recorded less than 10k distance covered in a full match, home or away." "Yeah, well, numbers," said Graham cynically. With sufficient scouting complete, the buying club needs to figure out whether the transfer is doable. They're not supposed to speak to the player or his agent without permission, so they'll usually engage a trusted agent to act as an intermediary. This person will find out whether the player would consider the move and what sort of deal (in terms of contract length and wages) it would take. They will also approach the selling club to get a sense of valuation. These are crucial steps. Clubs don't want to be embarrassed by bidding for a player who then turns them down. (Alexis Sanchez refused to join Liverpool in 2014.) Often the selling club will also employ an agent-middleman to discreetly tout their players around, all in the name of maintaining discretion and "plausible deniability." Only then is there an official approach. Why? You could unsettle your own players if you go public with bids for guys who play a similar position. Bigger clubs could get involved. The more high-profile a player, the more that can go wrong. "Do you like the steak, Dave?" asked Millingford City rep Rebecca Taylor. "It's excellent, isn't it? If you like your food, you'll love it at City. We have excellent chefs, personal dieticians and I know that Hans will want to fill you out a bit if you join. You could be a big part of our future, you know." Dave chewed happily and tried to speak. "Itsh like eating meat flavoured icsh cream!" he burbled. "All we've got to do is arrange a fee with Crumpleton and then we can open contract talks," she continued. "Isn't the fee agreed already?" asked Dave's father, Alan. "I mean, you've got permission to talk to us, right?" Rebecca smiled brightly. "How's that steak?" the two clubs about what the selling club wants in terms of a price, also known as the transfer fee. Very few transfers collapse once negotiations begin; there is usually enough consensus during the scouting and approach to make closing deals simple. 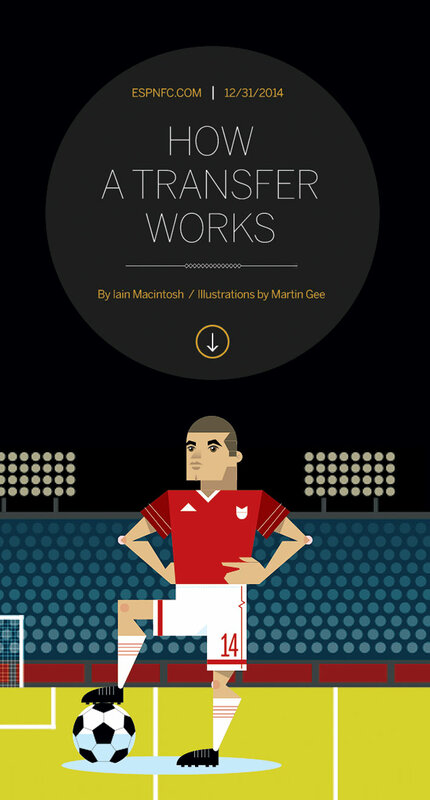 But when transfers do go pear-shaped, it's generally due to money. Either someone asks for more or the buying club suddenly offers less. "Oh come on, Tony," complained Charles, the Millingford City CEO. "Even you have to admit that 150,000 pounds a week is an awful lot to pay a 21-year-old who has never played in the Prem...Yes, I know he's good enough to play for England, but that's not...hang on, I'll get back to you." Charles stabbed the 'end call' button on his phone. Agents. You can't live with them. You can't kill them. And this wasn't the worst of it. When he did finally coax Tony down from a wage that could fund a space programme, he'd have to negotiate the agent's fee as well. Perhaps he could free up some money from Crumpleton's transfer fee. They were holding out for six million pounds, but maybe five million and a host of increasingly unlikely add-ons for things like winning the league would work? Once the details are agreed in principle, the player goes through the final part: a comprehensive medical. This can take time; it's a "special forces mission" of analysis to make sure there are no issues. If a player's had recurring injuries, the buying club will call in specialists to find out more. Worryingly for the buying club, it's the one part of the move over which they have no control. The doctors are in charge. Demba Ba's move to Stoke in 2011 fell apart due to "something that could cause problems later," while Loic Remy had agreed terms with Liverpool in 2014 only for the Reds to pull out after a lengthy medical gave them reason (though some say it was over fees) to end the deal. On command, Dave Thumper coughed loudly. "Yes," Doctor Hedges said. "Well, they both seem fine. Now, what about this neck issue?" "Oh yes," Alan said. "Yes, that has been an issue." "And he's been treated for it three times, always with anti-inflammatories?" said Doctor Hedge, flicking through his notes. "But it keeps coming back?" "Yes," Alan nodded. "Very painful. He can barely turn his head." "Well, I know a specialist, and she's very good. We can get her in to have a look, but it might not be until tomorrow." "Oh," Alan said. "I suppose we could just stop Dave from go-karting though, couldn't we?" "Go-karting," Alan said. "He wrenches his neck because he's trying so hard to win. Should we stop that?" Doctor Hedges sighed. "Yes, that would probably help." Transfers involving big clubs with large scouting networks usually take at least a full season, but sometimes it's two or three years from initial scouting to a completed deal. A rough ratio: of 100 players scouted, inquiries will be made for 10 and one or two will end up being signed. Smaller clubs are forced to operate a little differently, especially if they're losing players to bigger clubs. Agents will play a more integral role in offering players; scouts and managers will have less time to make a decision. However, there are instances when a deal can be done in a matter of hours, particularly if a club is up against a deadline and willing to take more risk on a player. Although there are many variables early in the process, once they reach the negotiation table, maybe only one out of every 10 deals will break down. And yes, teams in the Prem still use fax machines to communicate moves with the league, though scanned PDFs sent via email are also admissible. Hans Kruber put his arm around Dave and grinned for the cameras. "You must be so pleased to have secured the signature of Dave Thumper," one reporter shouted. "Of course," Hans said. "We have been watching David for many, many months, and we believe that he is one of your nation's finest prospects. He is fast, he is clever, and he has the potential to be even better. I know that our fans will love to see another English player here, and, who knows ... ha ha ... maybe I can teach him to take penalties for you, no?"